If youve been longing for a place where you can leave your stress at the door, then have we ever got the place for you! Located in the prestigious Aria Condos, luxury greets you the moment you step in the door. A sleek, modern kitchen with GE Profile stainless steel appliances and granite counters with counter-top seating overlooks the dining and living room area, allowing you to entertain company when you host friends and family. Two spacious bedrooms offer plenty of space to relax and recharge, and the spa-like master bathroom is the perfect place to let Calgon take you away. In addition to the numerous features of the unit, the building has ample amenities including: 24-hour doorman, security, on-site fitness center, an owners lounge, business center, guest suite, pet spa and dog walk area, and so much more. 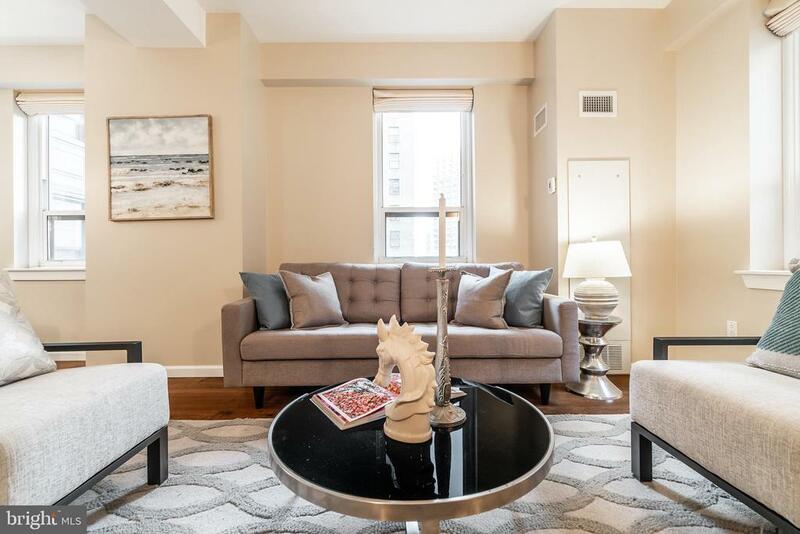 At this location theres a little bit of everything nearby, including Rittenhouse Square Park, 5-star restaurants including Vernick and Barclay Prime, luxury shopping at J Crew, Vince, Ann Taylor Loft, Nordstrom Rack, The Kimmel Center and Merriam Theaters, and so much more! This unit comes with one year of free parking at 15th and spruce. Please check OPA for 2019 taxes due to possible citywide reassessment.